Panorama of stunning Lake Matheson, also called Mirror Lake, on South Island of New Zealand at Sunrise. The Westland National Park is a beautiful area located on the South Island of New Zealand. This panoramic photo of Lake Matheson was taken with a view of Mt Tasman and Aoraki/Mt Cook reflected in Lake Matheson. The waters of Lake Matheson are dark brown, so on a calm day they create the ideal reflective surface. By a happy coincidence, Mt Tasman and Aoraki/Mt Cook are perfectly positioned to reflect in the lake. This image belongs to the travel and nature stock photo library. This stock photo of Panorama of Lake Matheson at Sunrise is available for licensing for commercial and editorial uses including websites, blogs, books, magazines, brochures and advertising. Restrictions may apply for images which contain third party copyrighted material or sensitive subjects. Photos of artwork are for editorial use only. 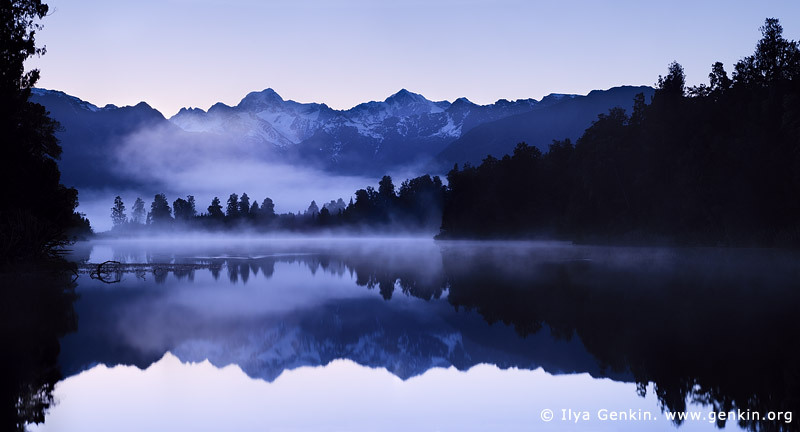 This image id NZ-LAKE-MATHESON-0006 of Panorama of Lake Matheson at Sunrise, is copyrighted © by Ilya Genkin. This is not a public domain image.